I recently decided to reevaluate my use of location-based check-in apps. For some time I’ve been an avid Foursquare user (Don’t try friending me, unless you know me, because I don’t want to go down that whole stalker road again), but I have been hearing more about some other services and wanted to give them a shot. After reading a few articles of some up and coming apps, I added, to my repertoire of attendance takers, these fine specimens: SCVNGR, Gowalla, Loopt, and Friendsaround. The following is a summary of my in-depth, scientific testing. Yeah, Yeah, that’s what it was. Loopt quickly got axed because of its fondness for wanting to keep my location beacon active on my phone, leading to quicker than average battery drain. In addition, Loopt really had nothing to offer me for my check ins, aside from letting my friends (one) know where I was. I mean come on, you’ve got to give me something. All I’m asking for is a points system, or nicely designed badges. I’d even settle for a funny sound upon checking in. Yet, what did I get from this app? Nothing but heartbreak. Loopt, You’re Fired! Too confusing – What’s a Fame, and why should I want it? I supposedly have 520 of them. Is there a cash equivalent? Ugly to look at – Really, orange? Who thought that was a good idea? Frank, pack up your things and turn in your badge. “No venues have been loaded yet.” – When trying to do a quick check in, so as to not look like you are married to your phone, there is nothing more annoying than having to create the place you are checking into. I can understand once in a while having to, but come on, do I really go to that unpopular of places? Beets-R-Us, had to create it. Snuggie factory tour, no one? The Love Shack, I don’t care what the sign says, it’s a little old place where we can get together, just not check-in. Friendsaround, you are the weakest link, goodbye! Now SCVNGR has a lot of potential, but still has aways to go. It has a points system, but I can’t figure out why, just that I’m accruing them. The badges are nice, but nothing interesting. Some businesses are even offering discounts for using the app, but these are smaller local places and the discounts aren’t that amazing. Where I can see SCVNGR really taking off is the challenges portion. You can create or do a task at the location and then get points for it. It could be anything from take a picture and post it while you’re there, to answer a question related to where you are. The problem so far is that I have only come across one place to have one of these challenges already created. I guess I could just start making them, but from the looks of it, I may be the only one. SCVNGR, I’m sorry to tell you that you have been eliminated from the race. From everything I can tell, Gowalla has the second largest amount of users, next to Foursquare. It works like a virtual passport, where you collect badges, pins, and items from locations you check-in to. I really like the custom location badges for a plethora of nationwide businesses. The items are very intriguing to me. With in the period of my testing I have collected a pair of ski boots, a scarf, and two digital slr cameras. What these are used for, I have no idea, but if some one out there knows, please tell me. So Gowalla, you passed the test. Don’t get to comfortable though, one peep out of you and back to the cellar you’ll go. Foursquare is good to me, and completely out in front of the competition. There’s still nothing comparable, in the other apps, to being mayor of a location in foursquare. 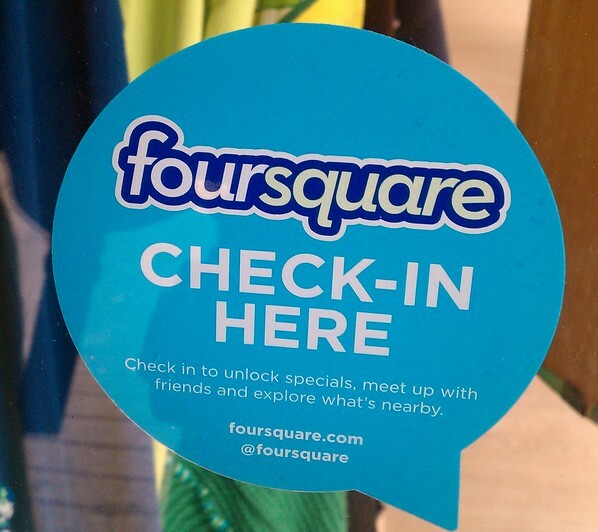 More and more businesses are offering discounts through foursquare, and some of them are actually pretty good. For now, this is still the best check-in app available. In the end, if you are in to checking in, just find something that you have fun doing. Then, try to convince your friends to do it to. So, what’s your experience with these apps? Have one you like? Are you linking it up with Twitter or Facebook? Most importantly, explain to me the Gowalla items? Please, I’m begging you. Check out what Vince Marotte is doing over at Gateway Church for first time checkins on Foursquare. You can check out his blog post on Church Crunch. Seems we have similar ideas about the use of this medium. Very cool. For more ideas dealing with location-based services check out my previous post on the subject. Some time between 5th grade and now, four square changed meanings. You know, the game with four squares on the ground and you have to bounce the ball into the other…… oh nevermind. It was at least after I worked at a camp during college, because I distinctly remember trash talking some middle schoolers about my mad skills on the indoor four square court. Now, it seems I’m trash talking coworkers about my foursquare skills, this time though the court is my phone and I’m the mayor. That’s right, I’m talking about location-based services. Before I dive to far into the subject, I have to admit, I got sucked in. I’m a chronic checkeriner (If that’s a word? If it isn’t, it will be soon. Watch out Palin, I’m coming for you.). I currently hold mayorships in…..(pause while checking my phone).. 7 places. Also, and the let’s get real here, I was a little sad when I lost my Chick-fil-a mayorship. Yet, even though I’m doing it, I still ask why and find it completely useless. Well sort of. The location-based social networking craze came out of no where and it’s gone crazy. Just off the top of my head, there’s foursquare, yelp, gowalla, Facebook check in, SCVNGR, Loopt, and many more apps that one can install on to their mobile device. It makes me wonder how someone coming up with a new service thinks they will change the way we click a button to say, “We’re Here!”. In old school terms, is there a better way to raise your hand to say you’re in class? Maybe that’s whats next, kids “checking in” at school. Wait, they probably already do. I see where retailers can use these services for giving out deals and coupons, we’ve taken advantage of 2 for 1 at Chipotle multiple times. It also makes sense that keeping up with friends is a nice plus, but isn’t that hard with all the service/app options? John’s on foursquare, Seth on gowalla, Mark on SCVNGR, it’s just so confusing. But what’s the greater use for this? I mean the technology is cool, but unless a better use is found, it will remain a gimmick and fall to the wayside like a 90’s slap bracelet. Good news for you is that I think I found it. It’s in the movement. My wife noticed that when enough people check in at one location on foursquare that location “trends” to the top of the list so that anyone about to check in to a nearby location sees that trending location first. Let’s look at this from a church perspective. Let’s say you are having an outreach event. Create an event location on any number of these location based services and then have staff and volunteers check in upon arrival. Your outreach is now becoming a movement in the online social world, trending up across multiple services and reaching audiences that might not normally come to one of your events. The end result is that, like flies to a bug zapper, people will stop by your event to just see what all the fuss is about. This is probably already happening to a certain extent without anyone planning it to. What I’m suggesting is that we be more purposeful with it. Plan it out ahead of time. It’s a very simple thing that could have far-reaching effects for your church in what we were put here to do. So, spread the gospel one check in at a time.